One of the most disturbing aspects of the evil feline is her insistence of being a part of every bodily function a person has. She wants to be there when you defecate in the form of what you use, what you wipe yourself with (in a a variety of patterns including KISS) and where your waste eventually ends up. Then she insists on being around when it’s that time of the month and when things need to be refreshed down there (and that doesn’t even address those that feel it necessary to decorate –NSFW). Of course, she also wants to be around when any type of sexual activity is taking place (flavored versions as well if that’s what you’re into). So I guess it really shouldn’t be a surprise that she wants to be there helping you pump your breast milk when that time arrives as well. Yes, that’s right. 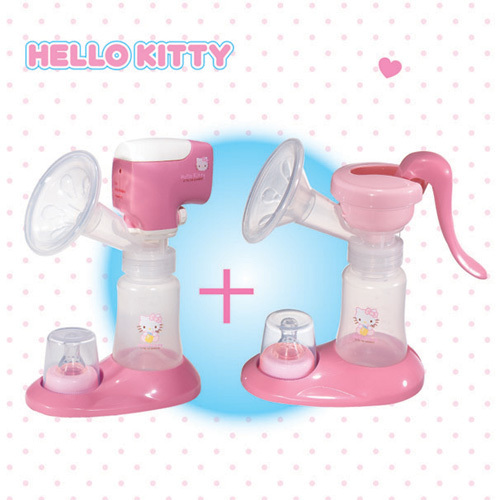 The people at Sanrio have decided that what the world really needs is both an electric breast pump and a hand breast pump featuring the cat-with-no-mouth.